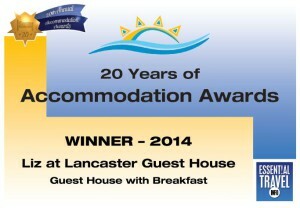 We are delighted that we won an award as a winner in the 20th Annual Accommodation Awards in 2014. This award programme is based on customer feedback and is a programme which used to be run by AA Travel and was then taken over by Essential Travel. Going forward, the programme will be absorbed into the Lilizela Awards which is an awards programme backed nationally by the Department of Tourism and the Tourism Grading Council of SA (TGCSA); and locally by the Gauteng Tourism Authority (GTA). Unfortunately Liz was not able to attend the awards evening nor were any of Liz at Lancaster staff, but apparently it was a wonderful event held at Sci Bono Centre in Newtown. We were sad not to have been able to be there to accept our award in person. 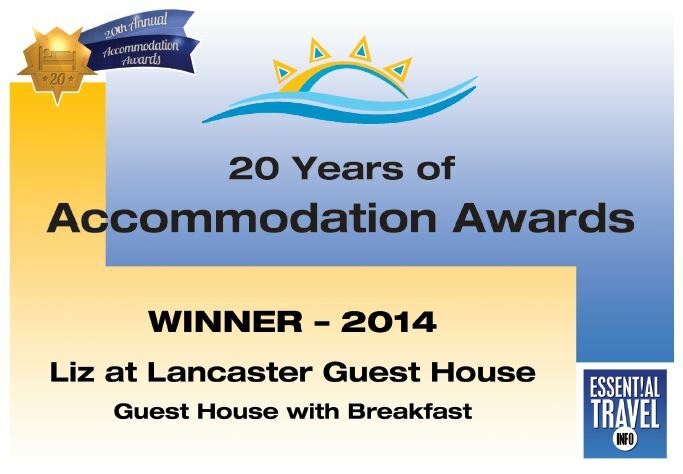 Thank you to the staff at Liz at Lancaster – Catherine, Zac, Thandie, Rose and Alick – for their hard work and excellent service which made this award possible ; and to our loyal guests whose positive feedback ensured that our winning results.